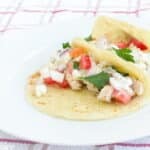 Today I’ll be sharing my chicken souvlaki tacos and a quick homemade tzatziki sauce recipe with you. If you’re wondering, “Why tacos?” read on about my experiences with Square Boy in Toronto, which makes me unable to accept mediocre pita bread, or mediocre tzatziki sauce for that matter. Back when we lived off The Danforth in Toronto, our favorite place to get take out from was Square Boy. Even if you’re familiar with The Danforth you might not know Square Boy. Square Boy is not part of the trendy strolling part of The Danforth, lined with fashionable Greek restaurants. It’s further west, down near the Mosque and the Middle Eastern Markets (which are awesome but not really part of “the strip”). We never would have strolled past Square Boy if we hadn’t happened to live right around the corner from it. So if Square Boy wasn’t our usual style, how did it become our favorite take-away spot? We noticed something about Square Boy: There was ALWAYS a lineup. It often trailed all the way out the door, sometimes past that white fence and down the sidewalk. Every single time we walked by, there was a line. We decided to leave our first impressions of Square Boy at the fence and investigate. Square Boy, it turns out, is not just about the food (which is delicious) but about the experience. You wait in that line with other hungry Danforthers trying to decide what to order. There’s the menu above to look at, but also you watch as other people’s food gets popped up onto the counter and then is passed from grey-haired Greek man to grey-haired Greek man on the other side as your toppings are added (Subway-style), including their fabulous tzatziki sauce. Mmmmm. (See the people waiting in the restaurant and the grey-haired Greek men working at the counter, and get a great history of Square Boy and info about its food here). When you get to the front of the line, if the man taking your order recognizes that you are someone who lacks a sense of humor, he teases. Guess who lacks a sense of humour? Guess who thinks that is hilarious? At this point, if you are someone with no sense of humor, you might look at your partner for help. You will see that your partner’s cheeks are red and puffed out trying desperately to hold in a laugh. See: Square Boy is an Experience. Then they load up your food with any of the toppings you want (always ask for extra tzatziki! ), wrap it in paper secured with a rubber band and off you go, skipping and running around the corner to your basement apartment and inside to the table in front of your tv where you sit down for a Friday Movie Night with THE BEST chicken souvlaki in all of Toronto, maybe even the world. Because of all this, I now can’t make Chicken Souvlaki at home. I never bothered at all when we lived in Toronto because if we wanted a good Chicken Souvlaki, I’d just go wait in line at Square Boy. Now that we live in Florida, I do try sometimes and it is always disappointing. The main problem is that there’s no good pita bread anywhere in the entire state. They just don’t have those rounds of floury bread as soft as marshmallow. I tried every single brand when we moved here. No good. Nowadays, when we’re in the mood for those souvlaki flavors I serve the skewers of chicken with roasted veggies and rice or Greek-style potatoes. Or I put all those flavors into a quesadilla. Or, as I did this week, into browned corn tortillas as a variation on tacos. Smothered in my easy homemade Tzatziki sauce recipe, of course! The Mexican shell works beautifully, I think, because Greek food and Mexican food have so much in common with the garlic, citrus, creamy sauce, cheese and fresh bright herbs. These Chicken Souvlaki Tacos would get teased to death at Square Boy (and they definitely would not be served there, mostly because their pitas are just too good to consider a substitute) but for an easy weeknight dinner that we all love and that takes me back to my grad school days in our basement apartment off The Danforth, these Greek-style tacos are perfect! In addition to not being able to find good pita bread in Florida, we also can’t find good store-bought tzatziki. The only one in our local grocery store has roasted red peppers in it and is the consistency of cold cream cheese, not the soft dollopable consistency of sour cream. I can’t be bothered to make a traditional tzatziki, which involves salting and draining cucumbers for ages. So I made my own quick and easy tzatziki sauce recipe instead! 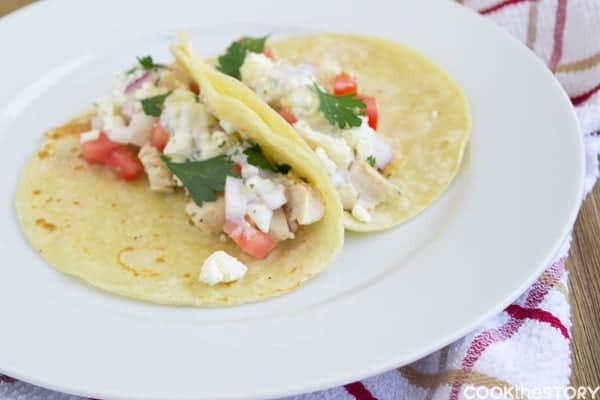 Oh, and you can use the tzatziki sauce recipe with more than just the souvlaki tacos. You can use it in my recipe for Greek Tabouli, too. 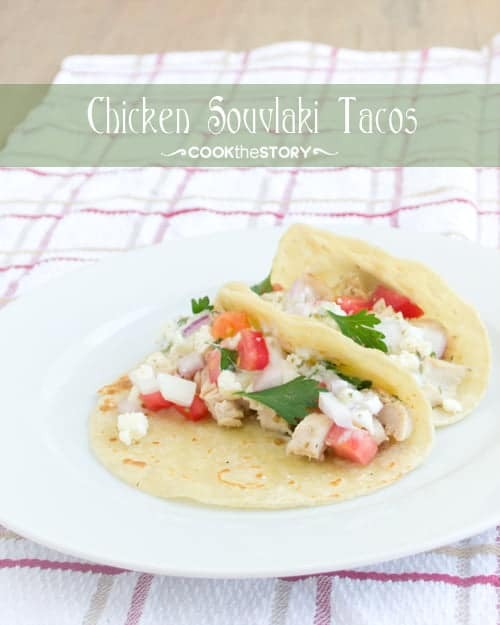 I hope you love this souvlaki chicken tacos and tzatziki sauce recipe. This quick and easy dinner uses leftover cooked chicken (or store-bought rotisserie chicken) but you can grill up some just for the purpose using a marinade with lots of garlic, oregano, olive oil and lemon juice. 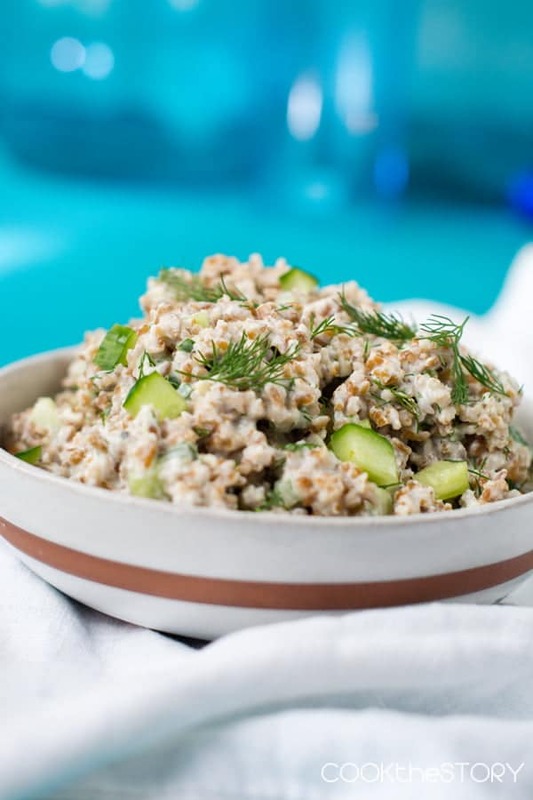 For the tzatziki sauce, you can absolutely use sour cream instead of Greek yogurt and green onions or minced white onion instead of the chives. Heat up the chicken meat in the microwave or in the oven. Warm a large frying pan over medium heat. Brush both sides of all of the tortillas lightly with vegetable oil. Put as many as will fit in a single layer into the warmed frying pan. Cook just until the undersides have some brown spots (2-3 minutes) and then flip them over and cook for another minute, just until some brown spots appear. Transfer the cooked tortillas to dinner plates and start cooking another round. As successive rounds of tortillas are cooked, fill those that are ready. Start by smearing 1 tablepoon of tzatziki along the diameter of the tortilla (a line along the center of the circle). Top with 1/3 of a cup of the warm chicken meat. Add a pinch of oregano, about 2 tablespoons of diced tomato, 1 tablespoon of red onion, another tablespoon of tzatziki, 1 tablespoon of feta cheese and a few leaves of parsley. Fold the taco shell in half over the filling and move onto the next warm tortilla. Line a plate with several layers of paper towel. Put the minced cucumber on it and sprinkle with a pinch of salt. Toss it around to mix it in. Wrap the towel around the cucumber and press down gently. Leave it there, wrapped the dampening towel until you're ready for it. Onto a cutting board, mince the garlic. Add a good pinch of pinch of salt to the garlic and then use the side of your knife to mash the salt and garlic together. 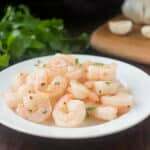 This extracts juices from the garlic and makes it easier for the flavors to spread around. Scrape the garlic into a medium-sized bowl. Add the yogurt, the slightly-dried cucumber, the chives and the lemon juice. Stir to combine. Taste and add more salt if desired. The tzatziki is fine made the day ahead. Just drain off any liquid that has accumulated on the top and give it a good stir before serving. Adding this one to the list. 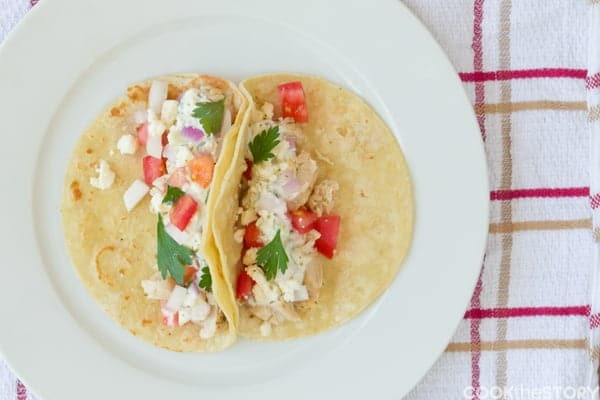 Love the twist on Tzatziki and Tacos! Being a Greek, I grew up eating such stuff! Your version of tzatziki is perfectly fine! Just for you to have an idea in Greece we make tzatziki with only 4 ingredients; Greek yogurt, cucumber, garlic, a drizzle of olive oil and salt. Very easy and perfect in its simplicity. I love mixing kitchens and trying different things all the time. Your souvlaki looks very tasty! These are just awesome! I love this club! Can’t wait until guacamole. The tacos look amazing. I remember the delicious Square Boy, it was one of our favorites too. Thanks Mom! We sure miss that place!